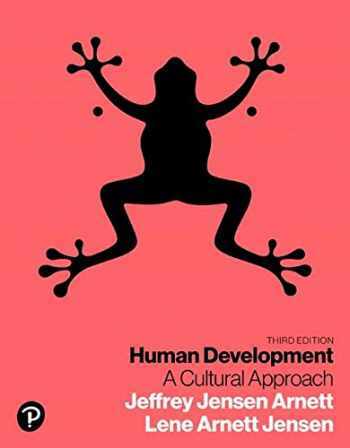 Acknowledged author Jeffrey Jensen Arnett wrote Human Development: A Cultural Approach (3rd Edition) comprising 768 pages back in 2018. Textbook and etextbook are published under ISBN 0134641345 and 9780134641348. Since then Human Development: A Cultural Approach (3rd Edition) textbook received total rating of 4 stars and was available to sell back to BooksRun online for the top buyback price of $87.99 or rent at the marketplace. For courses in Lifespan Development Help students understand how culture impacts development — and why it matters Human Development: A Cultural Approach leads students to examine all stages of development through the engaging lens of culture. Jeffrey Jensen Arnett and new coauthor Lene Arnett Jensen integrate cross-cultural examples throughout the narrative to reveal the impact of cultural factors both in the US and around the world. The 3rd Edition includes thoroughly updated research and data for a learning experience that best prepares students to face challenges in our diverse and globalized world — whether they travel the globe or remain in their hometowns. Human Development: A Cultural Approach, 3rd Edition is also available via Revel™, an interactive learning environment that enables students to read, practice, and study in one continuous experience.